Presently working as Guest Professor at the Leshan Normal University –China, Visiting Professor at the Kathmandu University- Nepal, guest lecturer at Tribhuban University, Visiting Fellow	-Tromso University Norway, Visiting professor -	Kathmandu School of Law, Purbanchal University, Nepal and several Nepalese army’s and Police’s academic institutions as well. 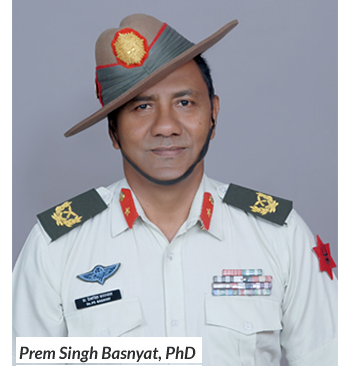 Brigadier General (Retd) of Nepalese Army, a Para Commando (Special Forces), fought several counterinsurgency battles, also led battalion as battalion commander during insurgency at home, with expertise on Disaster Management, museum curator, scholarly writing on history-culture , Global Security, Peace building, Civil Military Relation, Disarmament Demobilization and Reintegration (DDR), Security Sector Reform (SSR), Army Officer Cadet selection as T.O. . Authored several books and articles on peace building, trust building, international security, national security, diplomatic history, conflict management, military history, political history, heritage, culture. Life Member Military Museum , Kathmandu, Nepal. ७. किन खतरामा छ नेपालको राष्ट्रिय सुरक्षा ? Authored more than 70 articles on history, culture, heritage, international security, conflict management, national security, human rights, developments, etc. "THE ROLE OF MUSEUM IN IN CONFLICT PREVENTION" at the ICOM -China Expo Conference : 14-19 Sept 2016. “BICENTENARY OF ANGLO- NEPAL WAR: AN ANALYTICAL REVIEW” - The Nepal-Britain Friendship Society, Nepal – 08 June 2016. "THE ROLE OF CIVIL SOCIETY IN COUNTERTERRORISM" - The World Justice Forum, Hague, Netherland - 10 July 2013. REHABILITATION" - Institute of International Humanitarian Law, Sanermo, Italy- 29 May 2013. "TERRORISM ‘LEGITIMATE’ OR ‘ILLEGITIMATE’? AND ITS PREVENTIVE MEASURES IN SOUTH ASIA" - Securing Asia 2012 Seminar - London, UK – 2012. "FUTURE OF NEPALESE PEACE PROCESS" at the UNDP workshop, Kathmandu - 2011. "VIABLE SUGGESTIONS FOR THE REINTEGRATION OF THE MAOIST'S COMBATANTS IN THE NEPALESE ARMY", Centre for Peace Studies, Tromso University, Norway - 2010. THE HAITIAN DDR MODULE AND ITS OUTCOME ON THE GROUND", CPS, Tromso University, Norway - 2009. Hobby: Jugging, Scholarly Research, Reading. Dr. Basnyat visits India, China including Hong Kong and Tibet, Singapore, Thailand, Cambodia, Sri Lanka, United Sates of America, United Kingdom, Germany, Switzerland, Ireland, Netherland, Norway, Sweden, Croatia, Hungry, Bosnia, Serbia, Qatar, Haiti, Dominican Republic, Dubai, Lebanon, Egypt, Cyprus, France , Italy, South Korea, Bangladesh , Israel, etc. Book review of " The Invasion of Nepal"
Home address: Golfutar Bus Stop, Budhanilkantha Road, Kathamndu, Nepal.